Making his 11th start of the season, Gabriel Ynoa demonstrated why he's the Mets' 14th-ranked prospect. The right-hander recorded a career-high 11 strikeouts and allowed four hits over seven innings Friday night as St. Lucie blanked Dunedin, 5-0, at Florida Auto Exchange Stadium. "He pitched a great game and it showed," Mets pitching coach Phil Regan said. "He threw the ball well; he had great command of everything he threw. He's starting to throw the ball the way we expected." The 21-year-old matched a season low for hits allowed and did not walk a batter in lowering his ERA to 3.45. "He was able to keep a good hitting ballclub off-balance [by] working ahead and making his pitches, trying to make them uncomfortable, working inside or working out and coming in," Mets manager Ryan Ellis said. "[Catcher Albert] Cordero called a great game and caught a great game. " Since giving up seven runs over 4 2/3 frames on April 29 against Charlotte, Ynoa (6-2) has improved with each start and hasn't allowed more than two runs in a game. Friday marked his first scoreless outing in the Florida State League. Ellis and Regan attributed his recent success to Ynoa's ability to manage his rhythm. "Tonight he got back into working at his speed with his rhythm and tempo. The past two starts, he hasn't been able to keep his rhythm, but tonight he was able to," the Ellis said. "He's a smart kid, he knows when he needs to slow it down or keep it going." The native of the Dominican Republic led the South Atlantic League in wins last year, going 15-4 with a 2.72 ERA in 22 starts for Class A Savannah. And while his 3.45 ERA this year is not terrible, the St. Lucie coaching staff thinks it's a matter of time before Ynoa fully transitions to the higher level. "Umpires are a little bit better here and hitters are better. As he works his way up, he is going to have to keep making adjustments," Regan said. "He just has to have more games like tonight, where he is consistent. "You want him to throw eight out of 10 sinkers down and away, whereas now he is probably at five out of 10. Just getting experience -- once you get that, once you can change speeds and you have more confidence, you can throw the ball where you want it. And he did that tonight." Ynoa turned the ball over to Mets left-hander Gonzalez Germen, who worked around a walk and struck out two in his fourth scoreless outing of his rehab stint with St. Lucie. "He looks good, he looks healthy [and] his body has recovered health-wise," Ellis said. "He is getting the time off he needs. He is coming back stronger and making all his pitches, throwing what he wants where he wants. He's giving guys advice, making sure they're paying attention [in the bullpen]. They always pay attention, but he is helping them, and it's always nice for their development." Cordero drove in two runs and Jairo Perez chipped in an RBI for the Mets. Dunedin starter Matt Boyd (4-1) yielded an unearned run on three hits while striking out five over five innings in his second start since returning to the FSL. 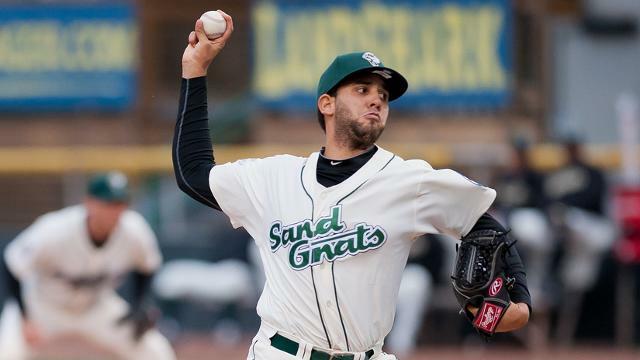 The 23-year-old southpaw went 0-2 with an 8.31 ERA in six starts with Double-A New Hampshire.